There are no 'tickets' on sale this year, folk are invited to spread the word through any and all sources. RAW 2014 Theme - its a Scottish thing! The main theme of this years Real Ale Weekend is Scotland and all things Scottish, what with the Commonwealth games, Homecoming Scotland 2014, The Rider Cup, and, what was it again - its hardly been on the news - oh yes, the referendum! 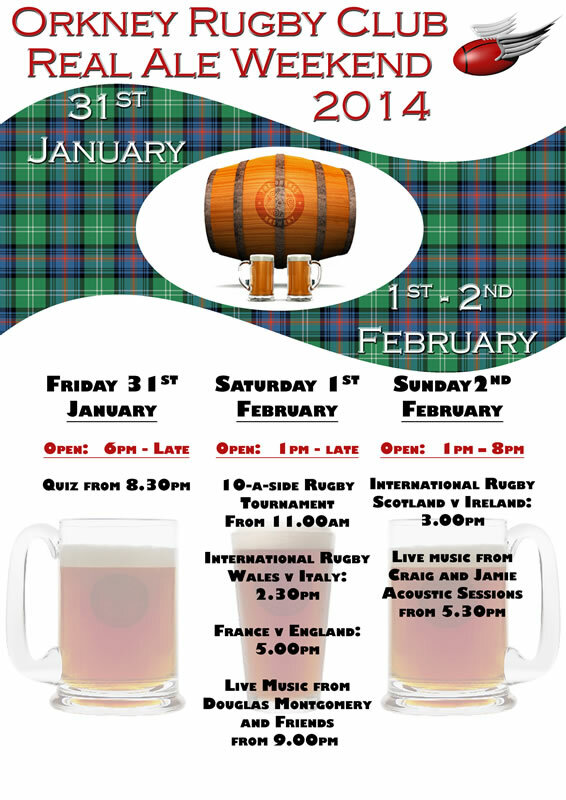 So all the ales are coming from Scottish breweries, We're trying to carry the theme through with the tartan background on the poster, Haggis Lasagne (SRU prize winning recipe from Ann Stewart) for the players after the 10s tournament, Scotch pies, Robert Burns, and some even more tenuous links!! Feel free to join in with the theme, put on your tartan skirt, kilts or tartan troos, wear your "see you Jimmy" hats, and wrap yourself in the saltire. Scotland for the 6 Nations!!! Orkney Brewery's Andrew's Ale makes its Orkney debut at RAW2014. Brewed in 2011 as a special ale for St Andrew's Day, this blonde ale is a "must try" this year. Norman agreed to brew this ale for RAW2014 to give our Real Ale Weekend "something a little different". Andrew's Ale is a light beer brewed with Brewers Gold and Cacade hops giving hints of citrus fruit and a light spicy finish. Catch it if you can! RAW2013 quiz champs to reunite at RAW2014 on Friday night, and are keen to hold on to their title. Graham Garson was glad to see the team together again, stating "it would be a shame to break up a winning combination." However strong challenges have being made by pretenders to their quizzing thrown! "Pip (Phillip Ross) reckons he and his teams' last place in 2013 was "a fix," "a lie" and "just slander". Pip reckons strategic changes to his team line up will turn things around. Willie Stewart's got his team together also, "the T F Bundy Club." Can Willie, Simon Butcher, Ian Carse, Brian Lanni and John White rise to the challenge? Apparently their wives also intend to put in a team, not sure who might end up top of the quiz leader board, but have a fair idea which team might drink more ale! RAW2014 Quiz, 8.30pm start on Friday (31 January) at the Club. Have you got your team together yet? The Club's Real Ale Weekend was once again heralded a huge fundraising success, helping to meet the Club's travel commitments at all age groups. The event was well supported, with over 115 folk at the Friday night quiz, 50 odd at the Saturday internationals and over 60 on Sunday for the Scotland match. The ales proved to be popular, and although not achieving the targeted 20 casks, the sales were similar to RAW2013, but the turnover was higher no doubt in part to the good numbers who stayed out to listed to Douglas Montgomery's "Rocker" band on the Saturday night, and Craig Rendall, Jamie Anderson, etc on Sunday evening. The rugby was the only down-side: the Currie Cup 10s had to be postponed due to Westray ferry cancellations; and Scotland were poor against Ireland (particularly in the second half). Depending on your point of view England succumbed to a late French try; and Italy were robbed in Cardiff. Roll on round 2. The matches will be live at the Club - Saturday at least - and there are still a few ales on!! !